Rice worth over N8bn has been lost to herdsmen attack this year in Benue State. The Commissioner for Agriculture, James Anbua, disclosed this during a press briefing in his office on Saturday. Anbua, who was fielding questions from newsmen on the aftermath of herdsmen attack on food security in the state, noted that Benue is ranked among the fifth largest producers of rice in the country, with the expectation of bumper harvest this year. Anbua regretted that the herdsmen attack on the state was coming at the time farmers were harvesting their rice, adding that the local government areas with comparative advantage in rice production because of their terrain were Guma and Logo, both of which are greatly affected by the herdsmen attacks. “Already, there is a threat to food security in Benue State. Agriculture starts from land preparation; by now, farmers in those areas are supposed to have started clearing lands for the next cropping season, but most of these people are in (internally displaced persons’) camps and they have not gone back to start the process,” Anbua said. 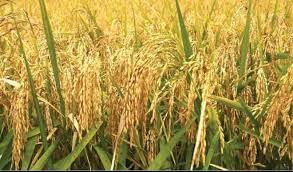 Anbua said the state expected bumper harvest for the 2017 cropping season because Benue State was one of the highest mass producers of rice that year. However, he said, because most of those rice farms were not harvested, the product was lost and even the little that was harvested was destroyed. Anbua lamented that most of the farmers affected in the herdsmen attack took the CBN-Anchor Borrowers’ loan.